New York: Heritage Press, 1945. 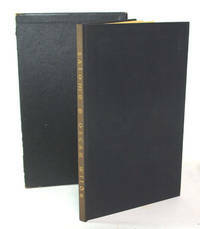 Near fine in decorated black cloth covered boards with gilt text stamping on the spine and with blind embossing on the front and rear boards with decorated end papers. The spine is slightly faded. Without a dust jacket as issued; however, the book is contained within a very good paper covered slip case with moderate wear to the edges. Translated from the French by Lord Alfred Douglas with a new introduction by Holbrook Jackson and decorated and hand-illuminated by Valenti Angelo. 51 brightly decorated pages in a French-fold format.